The second part of this look features a few alterations and additions. 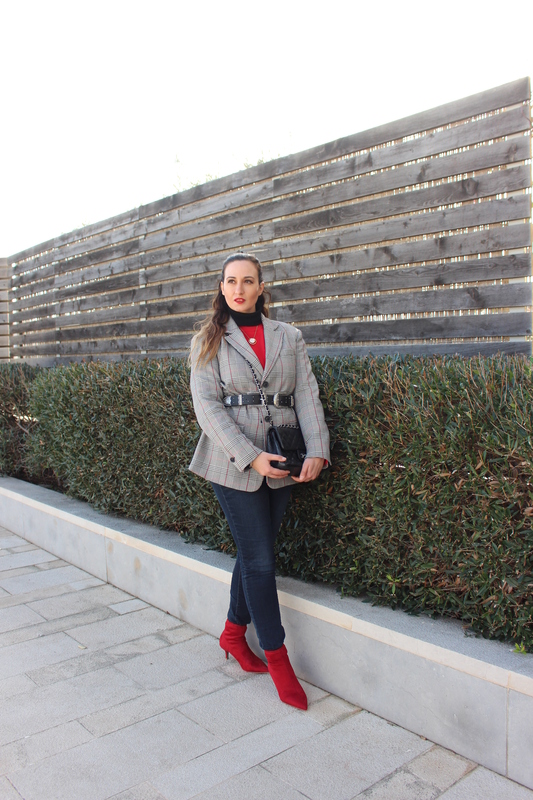 Replacing the black sock boots is a suede red kitten-heeled sock boot (the kitten heel was a pet peeve of mine, once upon a time – back when I was seen sauntering around in higher heels, I shunned this ‘ugly’ heel size but now it has become one of my favourite styles). 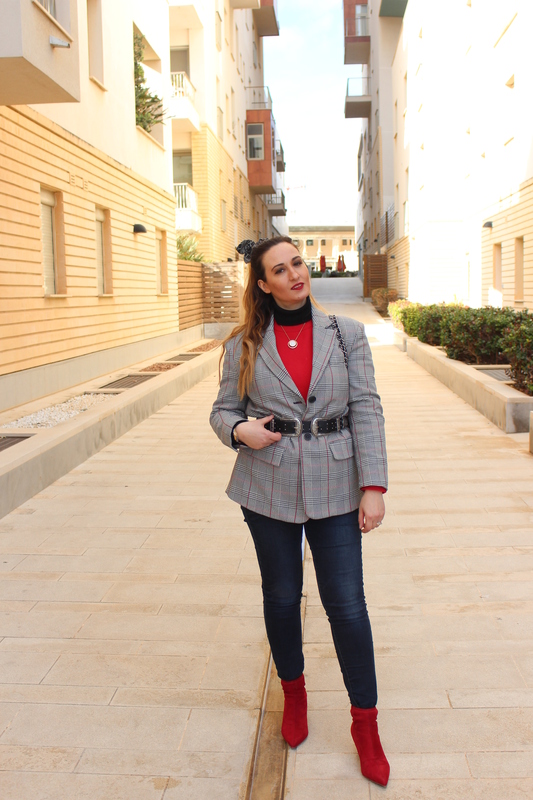 Another change is the blazer, which I layered on the top (so that it only peeks through) but with a fun accoutrement – the western-style belt that cinches in the waist. Now I know what you are thinking – am I wearing too many styles/eras/inspirations at once? If so, then forgive me, but there is something about this outfit that somehow comes all together because of the style of the individual pieces. This brings me to today’s point: identifying ourselves and our styles. We might be affected, influenced, and somehow inspired by so many people, factors, even places, that sometimes we do not realise this is happening. I have no idea where this inspiration came from, to wear these pieces this way. Probably from something I saw on Instagram. The point being, you make something your own, something that is part you, part who you wish to be. Wearing clothes should make us happier to get out of bed in the morning despite the bad mood/weather/things that happen. Wearing clothes is of course not the be-all and end-all (though there are people who make a career out of fashion, obviously). But for most of us, wearing clothes is a chore and an afterthought. Should it be a chore? Don’t we have enough of those to contend with? I do not dress the way I do (i.e. trying always to look put-together, stylish, and smart) because I fear people’s judgement (yes, I have had experiences pre-fashion blogging of bumping into people at the supermarket wearing something that I had just thrown on, but who hasn’t?) but because it makes me feel ready to take on whatever the day presents. Case in point: feeling a bit under the weather in recent weeks, one of the pick-me ups in the dreary mornings was opening the wardrobe and picking out something that would at least conceal the fact that I was feeling rather miserable (due to migraines or other ailments). I recall that one such outfit featured this same blazer that has become a fast favourite of mine. Mind you, it can be a tad tricky to wear often due to its structure, but the key is to wear something tighter or alternatively, tighten it (as here, with a belt). It can be truly versatile – I have worn it with skirts too, but my favourite has to be a pair of leather pants because of its sleek snug feel. Do you have such a piece in your wardrobe?